Distributor: Currently licensed by Right Stuf International under their Nozomi/Lucky Penny imprint. Notes: This movie takes place during the main (Universal Century) Gundam timeline. Fair warning: there is a brief spoiler near the middle of this review regarding a character who is featured in this movie. The culmination of the TV series Mobile Suit Gundam, Gundam Z, and Gundam ZZ, this movie resolves the relationships of the main characters, the idealistic Amuro Rey, and the charismatic Char Aznable. The gears have been set into motion, as Earth's colonies fight for independence from the mother planet with a plan to crash an asteroid into it, making it forever inhabitable. Can anyone stop the self-destruction of the human race before it's too late? It helps to have a bit of perspective when you watch this movie. First off, it helps to have seen at least one Gundam series from the main timeline (which does NOT mean Gundam Wing, folks). The very first time I watched this movie (back in '99), I had just seen the first few OAVs of the excellent 08th MS Team series, and though AnimeVillage hadn't yet released Gundam when I saw this movie, I still feel like I have some background to work off. 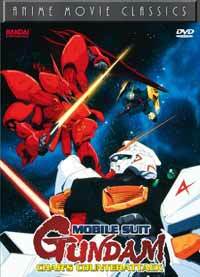 And having been disappointed by the fluff spinoff Gundam X, I really wanted to see what classic Gundam was really like. THIS is truly the epitome of everything I'd imagined Gundam to be: one of the classic space operas, epic in scale, with tons of realistic characters, richly laden with enough drama and action to truly fill the screen. If anything, even more than the mecha, which fly across the screen to do battle like the knights of yore, the characters themselves are the heart of the movie. *especially* Char Aznable. Char is simply the most captivating anime screen presence to grace the screen, whether large or small. He is so convincing, and so utterly human, that at times, you actually want *him* to win, even though his plans are so ominous. He does the wrong thing, but his cause is just, and you feel just as much for him as you do any other character in the movie. What Char has to say is prescient ... it is no wonder otaku quote him to this day. Char is simply the shining knight of Gundam, but he's on the wrong side of the battlefield. On the other side is the youth, Amuro Rey, who, while decently played, can only hope to compete with Char's personality onscreen. Yet he's an earnest, well-meaning, and heroic character in his own right. There are so many different characters that are introduced (and re-introduced) in this movie, sometimes, it's hard to keep track of them all, especially during the furious battles that erupt midway through the movie. It's Shakespearean in a way - major and minor characters alike die...in droves, few fulfilling their ultimate goals. It's just like war - it doesn't matter who's famous and who's an unknown, for you die all the same. Some find this impersonal, and some find it very realistic. In the midst of all the action, there really is something to be said about this movie - and how space, in the future, can be a graveyard of the lost just like the battlefields here in Earth. It is actually a movie that forces you to think about ideals and beliefs and wonder if they're really worth holding on to when all they seem to lead to is self-destruction, as it seems to do for Char. If there is one character I *don't* like in this movie, it has to be Quess Paraya, whose callous (and ultimately murderous) nature does not sit well with me. (And her character design is terrible! Kodachi times two!) The ultimate in childish ignorance is when she has just destroyed her father's ship (with her father aboard) and mutters something to the effect of, "Oh, I might have killed someone there." To her, war is a game ... a game that ends in her death. As far as the technical aspects, they're what's to be expected in a movie of this scope. Fairly high quality (for the late 80s), with decent music, and designs that update the TV series well, though some characters look very much alike. (Of course, the series *did* premiere in the late 1970s.) The characters themselves, however, are what drive this movie: again, you get a saga you want to see to its conclusion, and it is a dazzling experience indeed. The ending may be a bit on the too-metaphysical side (and everyone take note of the symbolism here), and the very fact that the true fate of the two heroes is left unsaid may infuriate viewers who need a sense of closure (i.e. most Americans). But as they have already played their roles in the saga, nothing more really needs to be known ... the ending adds nothing more than is needed. Viewing this again on the big screen year later, after having watched more of the Gundam saga, I feel that this movie holds up to repeat viewing, and while I probably could nitpick here and there on technical details, the positives to be found here override any such objections quite easily. I found myself again enjoying the characters, the action, the animation, even the ending, all over again. I like it all. Mobile Suit Gundam: Char's Counterattack is a breathtaking look at what Gundam truly is: a very human saga that spans the breadth of human emotion and experience. This is a true classic of mecha cinema, and as such, is one of the best of anime. However, the casual viewer may completely miss the point, glossing over all the symbolism and drama and dismissing this as just another giant robot show. Which is simply too bad. Recommended Audience: *Lots* of characters die, but the violence is mostly limited to explosions and destroyed robots. Good for teens and over though, especially fans of the mecha genre. A must-see for any Gundam enthusiast or serious fan of anime.